Add Nitrogen Bottle Upgrade Kit? Do you dream of hitting switches at every stop light? Want your wheels to come off the ground when you raise your ride? Want to scare old ladies when you let the air out of your 'bags? This is probably the kit you want! AVS 1/2" Valves - 8 of these give you that "front, back, side-to-side" action, and they give it to you NOW! 1/2" DOT-approved air line - 50 foot roll is enough to plumb the entire system. Brass DOT-approved PUSH-CONNECT fittings - we give you everything you'll need to put this setup together with the valves mounted out at each corner where they belong. Viair 480C Dual Compressor Pack - these compressors will keep your system locked in at 200 psi, and ready to show off. TWO 5 Gallon ALUMINUM air tanks - 10 gallons of air will give you the playtime you need to play with those switches. AVS 7 switch handheld controller - with front, back, pancake, and individual controls, there's nothing you won't be able to do. 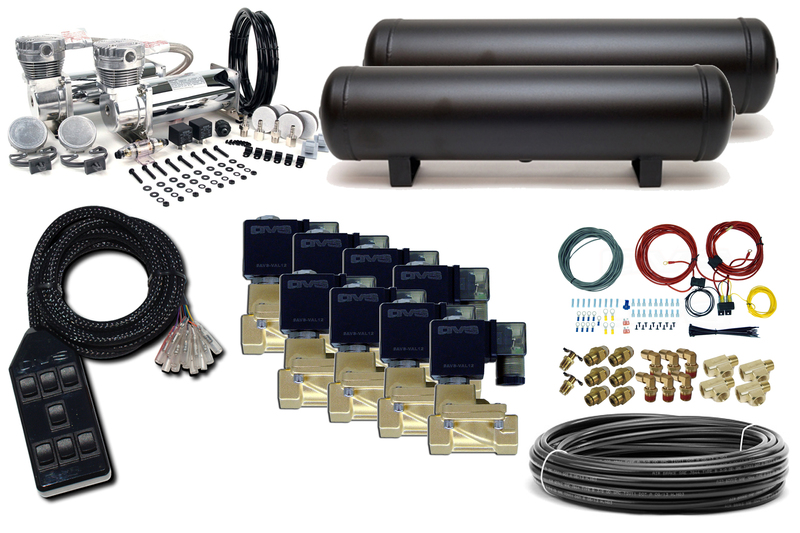 Complete wiring kit - pre-wired to run up to your battery and back to your air compressors, this package will save you countless trips to the parts store during installation. STILL not enough for you? Add our Nitrogen Add-on Kit and let the party keep going all night! We don't include gauges with this system, because the response time is so fast you really won't be able to dial in an accurate pressure anyway! Seriously- this kit will make your car jump. Add gauges if you want, but you'll never use 'em!